Reprimanded by Knesset's Ethics Committee, Ben Ari responds: "Whoever demonstrates against the IDF during a time of war is a traitor." 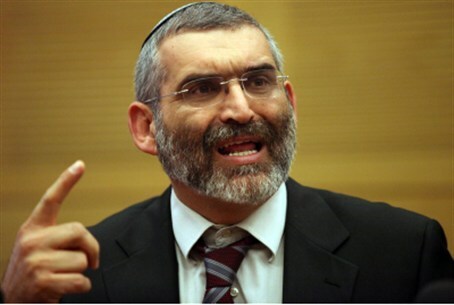 The Knesset's Ethics Committee has reprimanded MK Michael Ben Ari of Otzma LeYisrael for alleged statements of incitement made at a November rally during Operation Pillar of Defense. The statements in question were made when Ben Ari and his supporters countered an Israeli anti-war demonstration in Tel Aviv, coming out in support of the IDF and Israel's right to defend itself. Many people took offense to some of Ben Ari's statements, namely his calling left-wing demonstrators "traitors," his participation in chants telling leftists "to go to Gaza," and for alleged calls for bloodshed in Gaza, telling the crowd, "Why is it only 200 strikes and 15 killed? We want 15 strikes and 2000 killed!" After the rally, videos of Ben Ari's statements circulated on the internet and the Ethics Committee received various complaints from Israeli citizens regarding Ben Ari's statements, mainly for claims of incitement to violence. Ben Ari responded to the complaints brought against him by saying, "I do not take back what I said. Whoever demonstrates against IDF soldiers during a time of war is a traitor. At a time when our soldiers are risking their lives, whoever participates in a a traitorous act against the nation of Israel is clearly someone who identifies with the aggression of the enemy and should go to Gaza." Usually the Ethics Committee does not exercise its powers in these kinds of cases, citing the principle of freedom of expression, especially in regard to Knesset members. However, the Committee said that freedom of expression has its limitations, even for Knesset members, and that in the case of Ben Ari the line between acceptable, passionate statements and incitement was crossed. According to the committee, cries of "leftists go to gaza" are improper in political speech and are not in accordance with the way members of the Knesset should behave or represent themselves and are a misuse of political power.